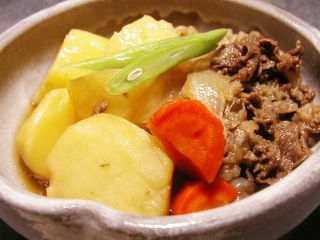 The name nikujaga simply means meat (niku) and potatoes (jagaimo). This is my favorite, but I still cannot make it exactly the way I want. 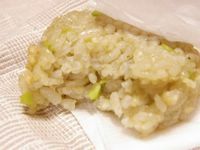 I tend to make it a bit too sweet… then the nikujaga alone testes pretty good, but when eaten with cooked white rice, I feel that it’s not the perfect match. 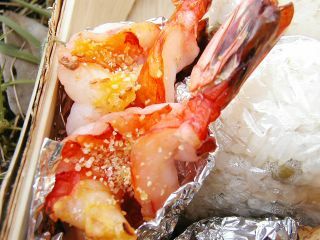 I’m still in search of a tasty but not too sweet or too salty nikujaga recipe that goes well with white rice. I’ve experimented some tips like adding a bit of sesame oil when sautéing or adding just a little butter at the end, but I'm still not satisfied yet. The one I made today wasn’t such a great success. 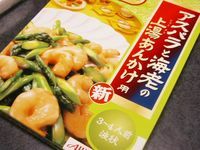 Well, I’ll keep trying…like all other on-going experiments in my kitchen, not because I want to hunt a husband but simply because I want to become able to cook and enjoy my "dream nikujaga." Aloe vera ... Do you eat this in your country? I never expected anyone to guess this right, but yes, this is aloe vera!! Aloe vera is commonly seen in Japan, I guess, and I always thought it was a medical herb. When I was a child, my grandma would apply it to any of the cuts/scratches I got. At that time, no one in my hometown thought about eating Aloe vera, because the kind we had there tasted terribly bitter. It was only after I grew up when the edible aloe vera became known throughout Japan and aloe drinks/desserts became popular. Now aloe vera with yogurt is my absolute favorite. This aloe in syrup was cheaper but didn’t taste as good as the other brand I used to buy. 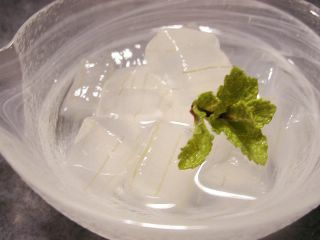 Looks nice and refreshing when served this way, though. Here comes another retort pouch stuff... 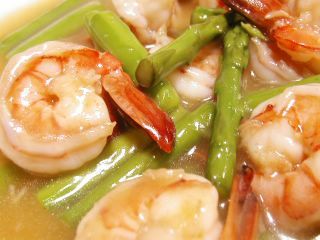 I stir-fried asparagus and prawns and mixed with this ready-made sauce. I don't know what you call this 上湯 sauce in English. Shang-tang? Anyway, the prawns were on sale today at a nearby supermarket. 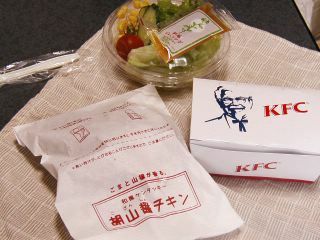 They didn't look very fresh, but tasted OK.
KFC with a Japanese Touch! 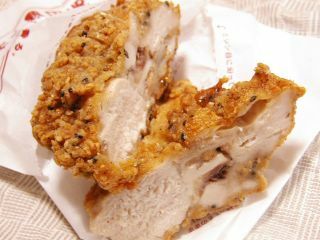 This is a “limited-time-only” menu at KFCs in Japan called “Gozansho chicken.” The name “Gozansho” seems to be the combination of part of the words: “goma (sesame)” “sansho (Japanese sansho pepper)” and “shoyu (soy sauce).” As you can see here, those are the main seasoning ingredients of this Gozansho chicken. 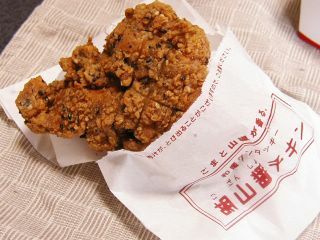 Ever since I saw the TV commercial of this gozansho chicken, I had been wanting to try it so badly. The combination of black sesame seeds and sansho pepper sounded sooooo tempting! 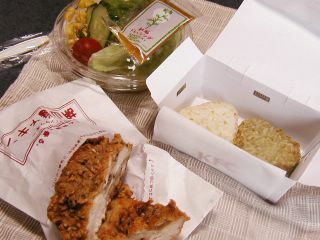 This was called “Gozansho chicken set” with one piece of gozansho chicken, salad with Japanese-style dressing and 2 small rice balls (white sesame onigiri and green tea flavored onigiri) for 570 yen (about 5.31 US$). Not bad. 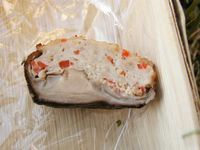 The chicken was packed in a paper bag with perforation. 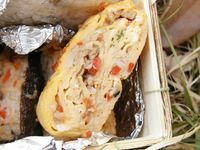 You tear it open along the perforation and use the bottom part of the paper bag to hold the chicken piece with while you eat. 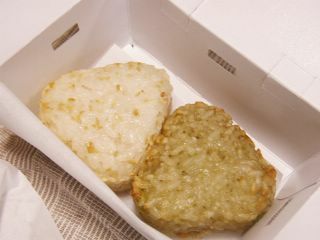 These rice balls look so cute, but the taste was just so-so. They were probably seasoned lightly on purpose, so that they won’t cancel out the taste of the chicken, I guess. 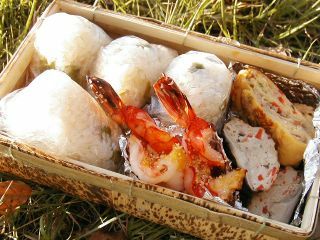 BTW, these are “yaki-onigiri (lightly grilled rice ball), so definitely need to be eaten while warm. BTW, if you are interested in how different their TV commercial is in Japan, check this site. Those are some shots from the gozansho chicken commercial. 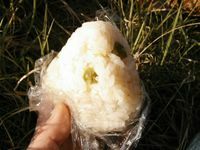 One more thing... My matcha onigiri had these small green bits that looked like roughly chopped edamame (green soybeans). Maybe partly because of this weather, I was so exhausted when I came home today after a long day. I craved for something sweet, and found 2 bananas turning almost brown on my kitchen table. OK, bananas. You are telling me to turn you into banana muffins, right? How I wished that I was living with someone to cook/bake for me! I thought I wouldn’t be able to stand up again once I sat down, and the mere thought of measuring flour and sugar and beating butter just brought me down. But you know what…. 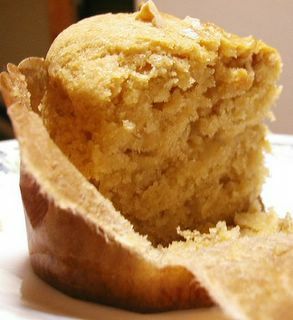 my craving for banana muffins finally won. 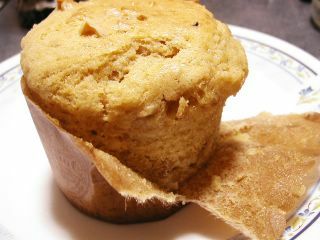 OK, now I’m just going to scarf down the muffins (with cold milk), and go to bed early. P.S. I added some photos of cherry blossoms at night on my another blog. Ohanami means flower-viewing. Bento is lunchbox. 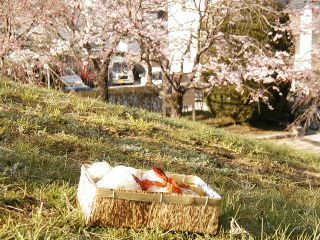 This is what I brought to a nearby park today to eat under the cherry trees there. 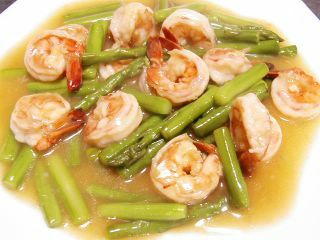 This is something close to what my mom loves to make for occasions like New Year’s day. But the ones I made today tasted just so-so...nothing great. I should have brought soy sauce or lemon slice for them.